April is School Library Month. Have you been using it as a means of spotlighting what we do and why we are indispensable to students and the whole educational community? Too many librarians don’t make use of the opportunity. In 1983, Judy King, the president of AASL, appointed Lucille Thomas to head a committee to create the first School Library Media Month (since we were called Library Media Specialists then). The committee worked diligently and in April 1985, the first School Library Media Month was celebrated. The committee prepared a 52-page handbook sharing ideas from local and state celebrations. The theme launching the week was, “Where Learning Never Ends: The School Library Media Center.” The theme is still true today. 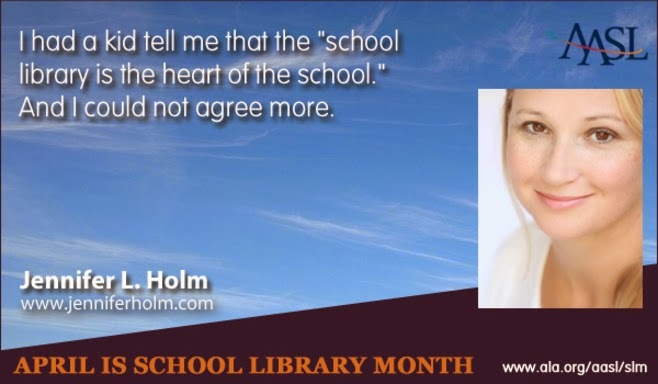 In 2010 the name of the month was changed to the current School Library Month, reflecting the AASL decision to revert to our title being School Librarians. 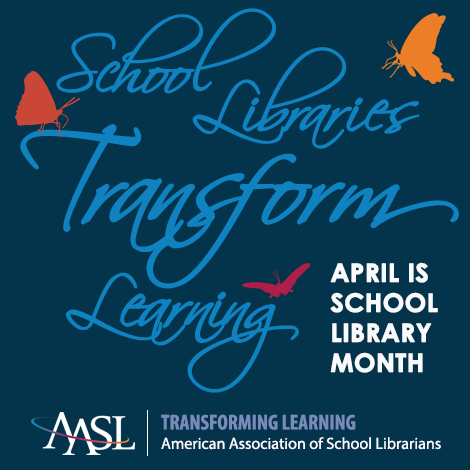 For this year, the committee chose “School Libraries Transform Learning” as the theme, which goes along with the ALA initiative Libraries Transform. Megan McDonald, author of the Judy Moody and Stink books is the spokesperson and she has done a PSA. Just as Lucille Tomas and her committee did, each year the School Library Month committee compiles resources for you to use. We have come a long way since that 52-page handout. A page on the AASL website is filled with activities and information for you to use. A new twist for this year was a way to put a butterfly with the hashtag #slm16 on your Facebook or Twitter profile picture. Also new this year was a padlet where school librarians from across the country shared how their program transforms learning. 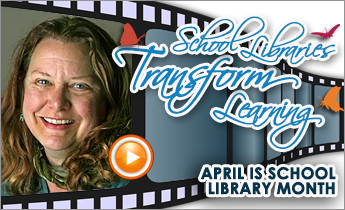 School Library Month maybe almost over, but the ideas are there for you to use in your school. With less than a week left, you still have time to do a few things and resolve to celebrate the entire month next year. You can’t pass up this easy way to begin advocating for your program. You don’t need to do anything big, but you should keep promoting the month – and you—several times during this celebration of school libraries. At the elementary level, speak to students about what like best about coming to the library. It will let you know which aspects of your lesson and the library environment the kids’ most appreciate. Let them know it’s School Library Month and hand them large hearts to fill in the sentence, “I love my library because….” Hang the hearts on the library walls. You can download this year’s from the AASL website. An online Calendar of Events opens with a calendar of ideas for every day in April. I really liked the one for April 18 which suggested a “Who’s behind the book?” contest. You take pictures of teachers and teachers covering their face with a favorite book. The object of course is to identify who they are. Another great idea is one from April 6 which has ideas for three different age levels. Film elementary students sharing their feelings about the library. Middle school students create commercials promoting the library, while high school kids make a commercial about your Makerspace or other non-traditional ideas or program. Keep it simple or go all out. The choice is yours, but recognize what this month gives you. Involving kids in the special activities you create for the month, gets them more involved and attuned to what the library has become. When you post it these on your website, parents check it out and they too become aware of how school libraries transform student learning –and the education community as a whole. So what have you done this year? What do plan on doing next year? Promote your school library. You have transformed your program. Get the word out. 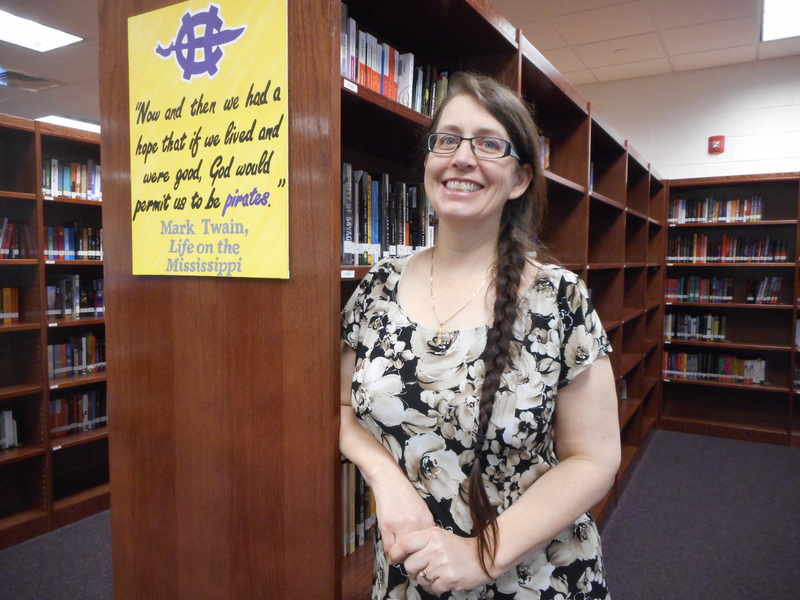 And as a special closing, I blogged last week about AASL awards and mentioned my personal connection the Ruth Toor Grant for Strong Public School Libraries, I want to share the press release of this year’s winner, Stephanie Hewett Rous, the librarian at Corinth Holders High School in Wendell, N.C. Many congratulations, Stephanie!